An easy walk of about 2.5 miles (4 km), taking an hour. 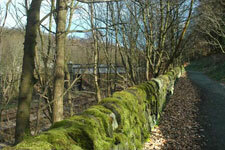 An ideal short route avoiding steep climbs, with excellent views across to Heptonstall and Old Town. 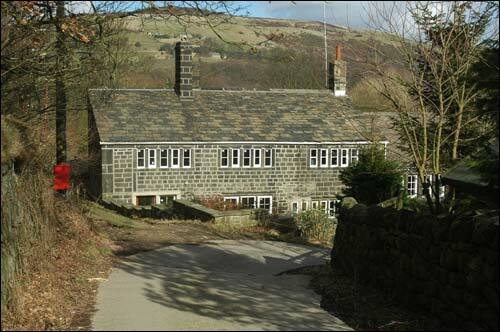 The destination, Wood Top, is an upland textile hamlet and area of fascinating traditional houses. Turn left at the bottom of the track down from Mytholmroyd Station, and then left on to the main road away from Mytholmroyd towards Cragg Vale. Cross the road and follow it round as it bends right. On the left is the Library. Leave this main road by turning right into Stocks Lane, just before Pot Luck, then immediately left up into Nest Lane, which becomes Park Lane. To being with, this road is still residential with old and new houses of various designs. 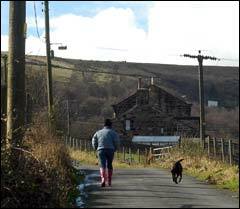 Soon you will be well above the valley and Heptonstall Church appears on an opposite hill 2-3 miles in front. 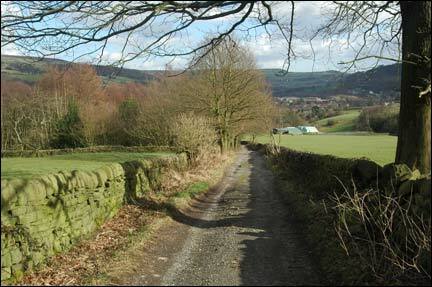 Continue along the lane. Past Park Farm (Park Cottages) the road becomes just a track. You will have been walking around 15-20 minutes and already there are no cars or people. 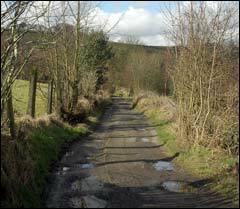 Continue for approximately 3/4 mile (1 km); this track becomes Wood Hey Lane. If you're lucky, you may glimpse deer. 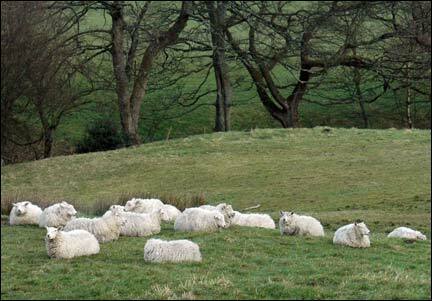 Otherwise, there are plenty of sheep. 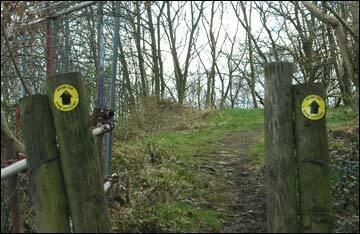 At junction, turn right onto concrete track, glancing left for grassed-over remains of disused reservoir. 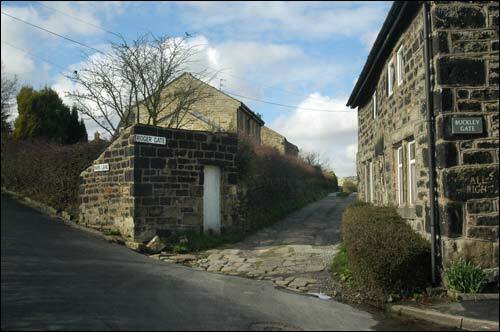 Pass a couple of terraced houses on the left (Shroggs), one with a date-stone, 1697. The photo above showing Shroggs is looking back. As you descend, the reservoir wall rises on your left. Wood Top was an old hand-loom weaving hamlet; by the late nineteenth century, it produced fustian - hard-wearing cotton material. Its inhabitants included the Saltonstall family; John was a fustian dyer, and one of his daughters, Lavena, a fustian clothing machinist, later became the best known of the local suffragettes. As you pass the post-box, continue downhill, keeping the mullion-windowed houses on your left. As you leave the Wood Top hamlet, look up to the house with a 1657 date-stone and turn immediately right, doubling back on yourself. After 75 yards, turn left down a track. 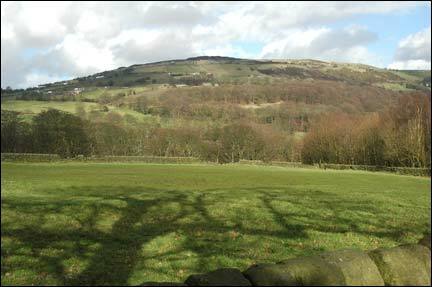 Enjoy the hillside views across the broad field. 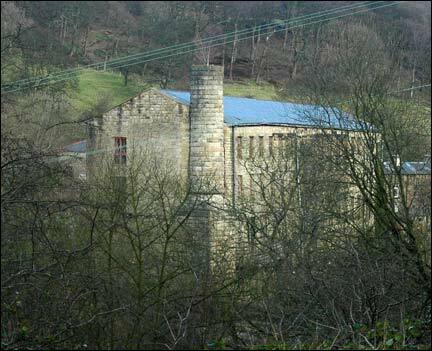 At the large stone barn turn left, and continue down over railway at Carr Bridge. 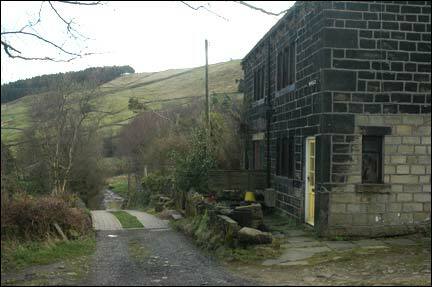 At the bottom, before the old clog factory, turn right up footpath, over stile and through wood. 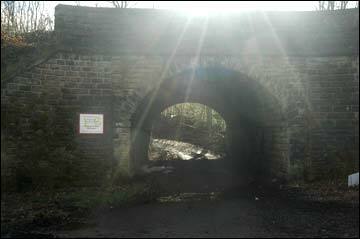 Facing the railway tunnel, turn left past the concrete plant. At end, turn right and on to rough road. 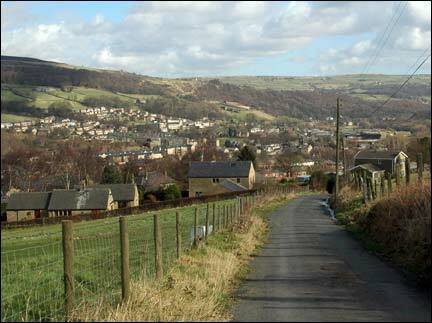 Left is the council's Highways depot, and above right are the new Caldene Croft houses. At the end, bear right and then left into Caldene Avenue. This suburban street takes you to Caldene Bridge. Turn right into main road, and first right back to the station.